The CE test is provided at the bottom of this article. As described in “Part 1, Principles & Normal Findings” (January/February 2017), dental radiography in dogs and cats constitutes an essential component of a comprehensive diagnostic plan.1-4 Part 1 also described appropriate mounting and display of radiographic films/plates for reviewing purposes, explained a recommended workflow to review radiographs and record findings, and presented radiographic examples of normal relevant structures. 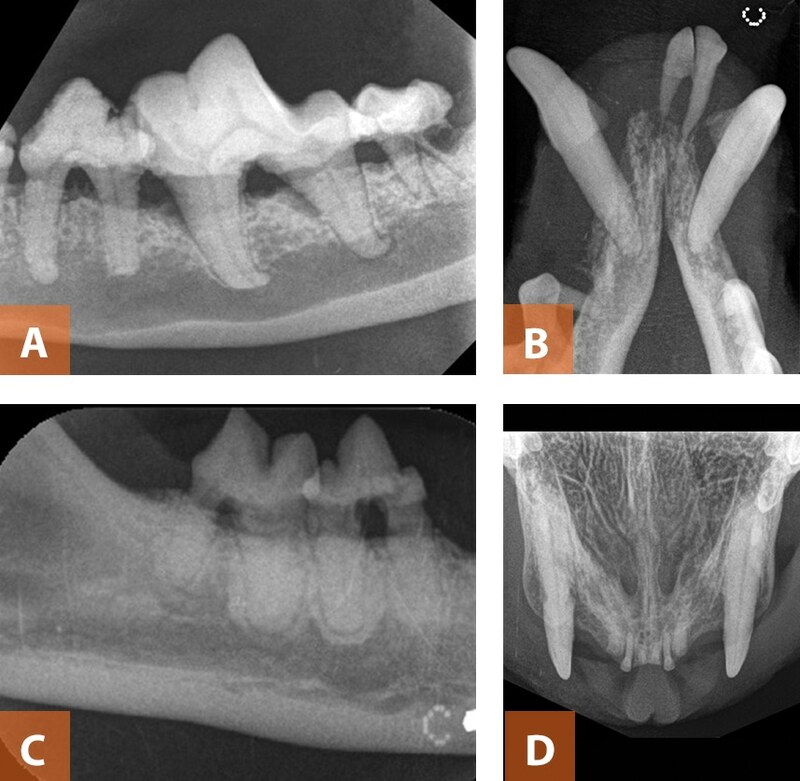 This article focuses on interpretation of normal anatomic variations as well as congenital and pathologic abnormal findings on dental radiographs in dogs and cats (Box 1). 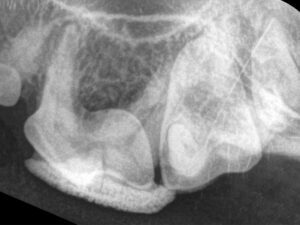 Both articles assume the reader is familiar with basic dental radiographic acquisition techniques, concepts, and skills. Persistent deciduous teeth with the permanent counterpart present (Figures 1A and 1B) are considered a pathologic condition of suspected genetic origin that predisposes the involved permanent teeth to periodontitis and malocclusion. This is a common condition in dogs, especially toy breeds, but uncommon in cats. The treatment of choice is extraction of the persistent deciduous teeth. Although the initial diagnosis is clinical, radiographs are necessary to document the orientation of the root relative to the permanent counterpart and/or other teeth in the immediate vicinity, as well as the degree of root resorption (if present). This information is essential to minimize potential collateral damage when extracting a persistent deciduous tooth. Figure 1. Persistent deciduous teeth. Figure 1A shows a persistent right maxillary deciduous canine tooth in a 7-month-old dog; the permanent counterpart is present. Figure 1B shows a persistent right maxillary deciduous canine tooth in a 6-month-old cat; the permanent counterpart is present. Figure 1C shows a persistent deciduous left maxillary second premolar tooth in a 1-year-old dog; the permanent counterpart is not present. Figure 1D shows a persistent deciduous left mandibular fourth premolar tooth in the same dog as Figure 1C; the permanent counterpart is not present. Persistent deciduous teeth without a permanent counterpart (Figures 1C and 1D) are usually smaller and slightly more radiolucent than the contralateral, adjacent, and/or opposing permanent teeth. Clinicians should keep in mind that the morphology of a persistent deciduous premolar resembles that of the permanent tooth immediately distal to it (eg, the deciduous fourth premolar resembles the permanent first molar) to it but is significantly smaller. Retained (unerupted or embedded) teeth (Figures 2A and 2B) are important because they can result in dentigerous cyst formation (see Jaw Lesions of Developmental Origin)7 and are, therefore, considered pathologic. Although deciduous teeth may be retained, most retained teeth are permanent. Figure 2. Retained (unerupted or embedded) teeth. Figure 2A shows a retained right mandibular first premolar tooth in a 6-year-old dog. Figure 2B shows retained left and right mandibular canine teeth in a 4-year-old dog. Note that the left and right mandibular premolar teeth are missing; based on history and breed, the absence of these teeth was considered congenital in origin. The cause of tooth retention is not always apparent. If a physical barrier (eg, bone, another tooth) did not allow the tooth to erupt, the tooth can be referred to as impacted. Retention of the first premolar tooth appears to be relatively common in brachycephalic dogs, suggesting possible genetic mechanisms.7 In some cases, historical or radiographic findings may suggest a traumatic origin (eg, local trauma during odontogenesis); some retained teeth may be dysplastic. As retained teeth are not visible clinically, radiographs are necessary to establish a diagnosis. Dental radiographs are indicated whenever there are missing teeth with no obvious cause (eg, previous tooth loss, extraction). Congenitally missing teeth (Figure 2B) are considered an incidental finding. The term hypodontia is applied when several teeth are absent; the term oligodontia is a relative term that can be used when only a few teeth are present.8 Congenitally missing teeth should be suspected if dental radiographs do not show retained and/or resorbing roots, unerupted teeth, or vacated and/or remodeling alveoli. Crowding and rotation (Figure 3A) may be considered normal or part of the standard in certain breeds (eg, brachycephalic dogs). Teeth present in severely crowded areas may be rotated owing to the lack of space; this is particularly common with the maxillary third premolar tooth of dogs with maxillary brachygnathia. Teeth that are in close proximity represent a plaque-retentive area and may therefore predispose an animal to focal periodontitis. Although crowding and rotation can be appreciated clinically, dental radiographs are useful to document the periodontal status of the teeth involved (Box 2). Figure 3. Crowding and supernumerary teeth. Figure 3A shows crowding of premolars with rotation and palatoversion of the right maxillary third premolar tooth in a 6-year-old dog. 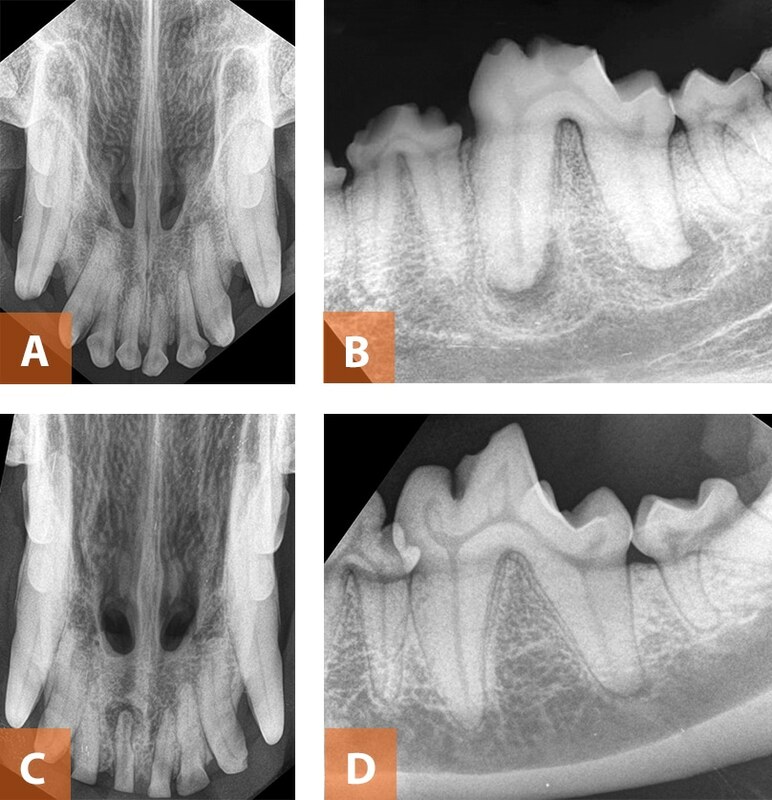 Figure 3B shows a supernumerary right maxillary first premolar tooth, as well as crowding of premolars with rotation and palatoversion of the right maxillary third premolar tooth in a 3-year-old dog. Supernumerary teeth (polydontia) (Figure 3B) can be present at any location in the dental arches. More than one supernumerary tooth can be present in the same area. Other than creating a plaque-retentive area and, therefore, predisposing the animal to periodontal disease, supernumerary teeth are usually considered a normal anatomic variation. Figure 4. Enamel hypoplasia. Figure 4A shows the clinical appearance of enamel hypoplasia affecting the maxillary incisors and canine teeth in a 7-month-old dog. Figure 4B is a lateral projection of the left maxillary canine tooth on the same dog; note the defective enamel at the mesial aspect of the cusp. Dysplasia (odontodysplasia) (Figure 5A) of the crowns of erupted teeth is evident clinically; however, malformation of roots or of unerupted teeth is only detectable radiographically. If only one or a group of adjacent teeth are malformed, local trauma or infection during odontogenesis is suspected as the cause. If odontodysplasia is generalized or semigeneralized, systemic acquired or congenital causes are suspected. Dens-in-dens (dens invaginatus; Figure 5B) is a rare malformation in which the enamel and underlying dentin invaginate towards the pulp cavity, sometimes resulting in a direct or indirect communication and, in some cases, secondary endodontic disease. The malformation may or may not be clinically evident. Radiographically, it may appear as a small tooth-like structure within the pulp cavity, and endodontic disease (see Endodontic Findings) is often present. Figure 5. Odontodysplasia and dens-in-dens. Figure 5A shows a dysplastic root of the right maxillary canine tooth in a 9-year-old dog. Periodontitis of varying severity is present at the incisors, canine, and premolar teeth, as well as external inflammatory tooth resorption at the second premolar. 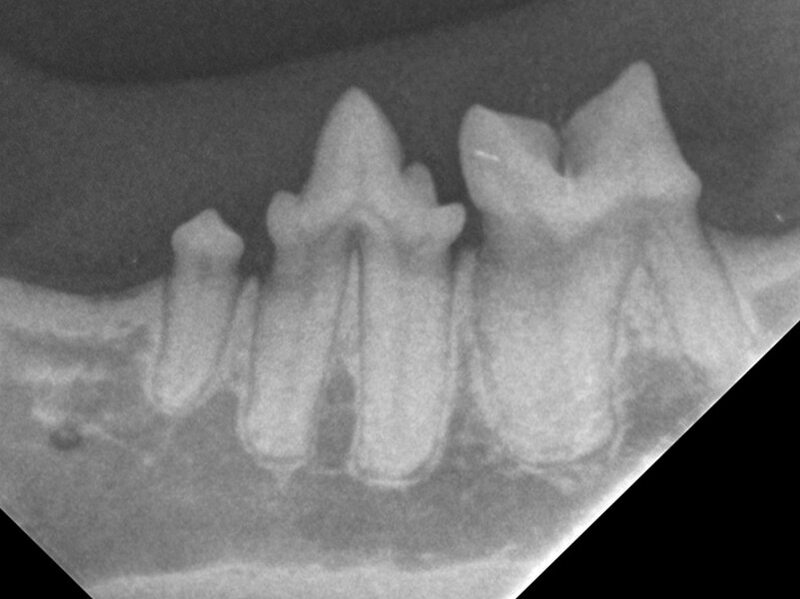 Figure 5B shows dens-in-dens affecting the right mandibular first molar tooth of a 5-year-old dog; note the abnormal appearance of the crown just above the furcation area and extending mesially. Double teeth (Figures 6A and 6B) appear to have two crowns due to gemination or fusion. Gemination occurs when two crowns originate from a single root; fusion occurs when the roots of two independent teeth fuse. Clinically, these conditions are indistinguishable; radiographs are necessary to determine if double teeth are due to gemination or fusion. Regardless, double teeth are most often an incidental finding. Figure 6. Double teeth. Figure 6A is a clinical image of a right maxillary first incisor tooth in a 4-year-old dog with seemingly two crowns. Figure 6B shows the occlusal radiograph of the same dog; note that the double maxillary incisor corresponds to fusion. Concrescent or fused roots (Figure 7A) represent nonpathologic anatomic variations of clinical relevance because they may affect the surgical approach if a tooth requires extraction. The roots of multirooted teeth are usually slightly divergent with alveolar bone in between. However, in some cases, concrescence occurs when the roots of a tooth converge and are only separated by cementum. In other cases, actual fusion of the roots occurs. Dilacerated roots (Figure 7B) have an acute angulation at their apical third. Although this is considered a developmental abnormality, it is not usually of clinical significance, unless the tooth has to be extracted for any reason. The extraction may require additional root exposure to avoid fracturing the tooth. Figure 7. Fused and dilacerated roots. Figure 7A shows fused roots at the left mandibular second molar tooth in a 5-year-old dog. Figure 7B shows dilacerated roots at the left mandibular first molar tooth in another 5-year-old dog. Peg teeth are relatively small, permanent mandibular premolar teeth with only one root (Figure 8). These are usually considered an anatomic variation of little or no clinical significance. FIGURE 8. Peg tooth. 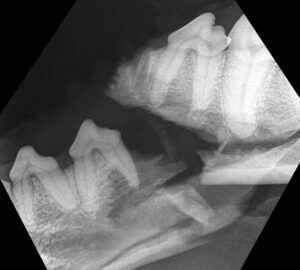 The radiograph shows an abnormally small and single-rooted left mandibular third premolar tooth in a 6-year-old cat. Dentigerous cysts, by definition, are associated with unerupted teeth. 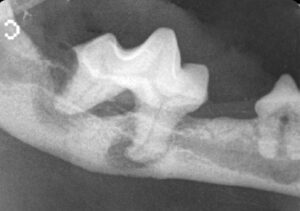 The most commonly associated tooth is the first mandibular or maxillary premolar in dogs7; dentigerous cysts have not been reported in cats. The cystic lesion is usually visible radiographically as an area of geographic bone loss (see Jaw Lesions) of varying size; in some cases the lesion involves adjacent teeth (Figure 9A). Figure 9. Jaw lesions. Figure 9A shows an unerupted right mandibular first molar tooth with an associated dentigerous cyst in an 8-year-old dog. 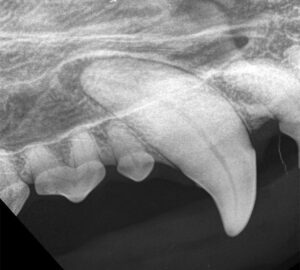 Figure 9B shows a caudal mandibular radiopacity just rostral to the mesial root of the right mandibular first molar tooth in a 6-year-old dog. Calculus deposits, when thick, can be visible radiographically (Figure 10) because of their mineralized nature. 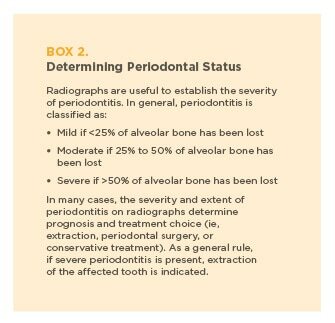 However, the amount of calculus accumulation visible clinically and radiographically should not be used as an indicator of the severity or extent of periodontal disease. FIGURE 10. Calculus. 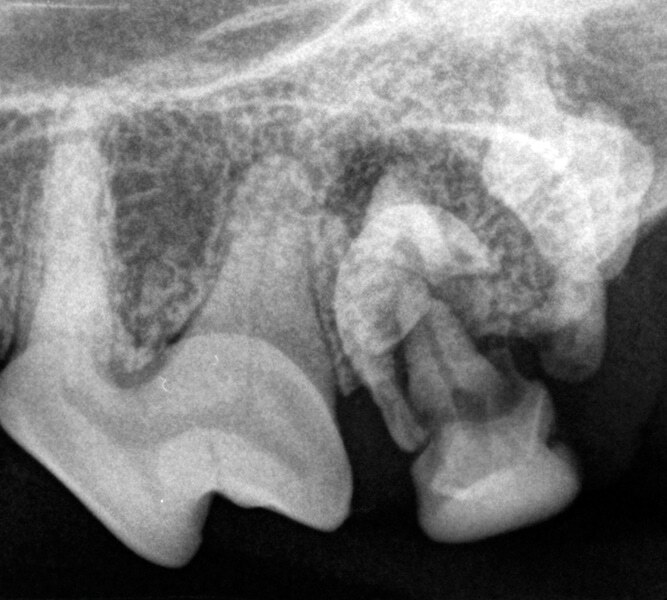 Heavy calculus deposits are visible radiographically over the left maxillary fourth premolar tooth in an 8-year-old dog. Alveolar bone loss by definition is pathologic. Namely, if alveolar bone loss is present, a diagnosis of periodontitis is established. Of the 4 tissues that compose the attachment apparatus of teeth (the periodontium), alveolar bone is the only one that is directly visible on radiographs. In general, alveolar bone loss can follow a vertical or a horizontal pattern. Vertical bone loss is when the defect is perpendicular to the cementoenamel junction (CEJ; Figures 11A, 11B, and 11C); horizontal bone loss is when the defect is parallel to the CEJ. A combined pattern can also occur. The pattern of bone loss is clinically relevant as it can affect therapeutic options. Buccal bone expansion is an alveolar bone loss pattern that seems to be unique to cats. Buccal bone expansion appears radiographically as bulbous and/or thickened alveolar bone with varying degrees of vertical bone loss, primarily on the buccal aspect of canine teeth (Figure 11D). More than one tooth can be affected. Furcation defects can occur at a very early stage of periodontitis because the furcation area is very close to the alveolar margin. Furcation involvement is used to describe bone loss that is observed at the furcation but does not appear to communicate all the way through (Figure 11C). In contrast, furcation exposure refers to through-and-through defects (Figures 11A and 11C). If furcation exposure is detected, the long-term periodontal prognosis is poor, and extraction is most often indicated, regardless of severity of periodontitis. Figure 11. Alveolar bone loss. 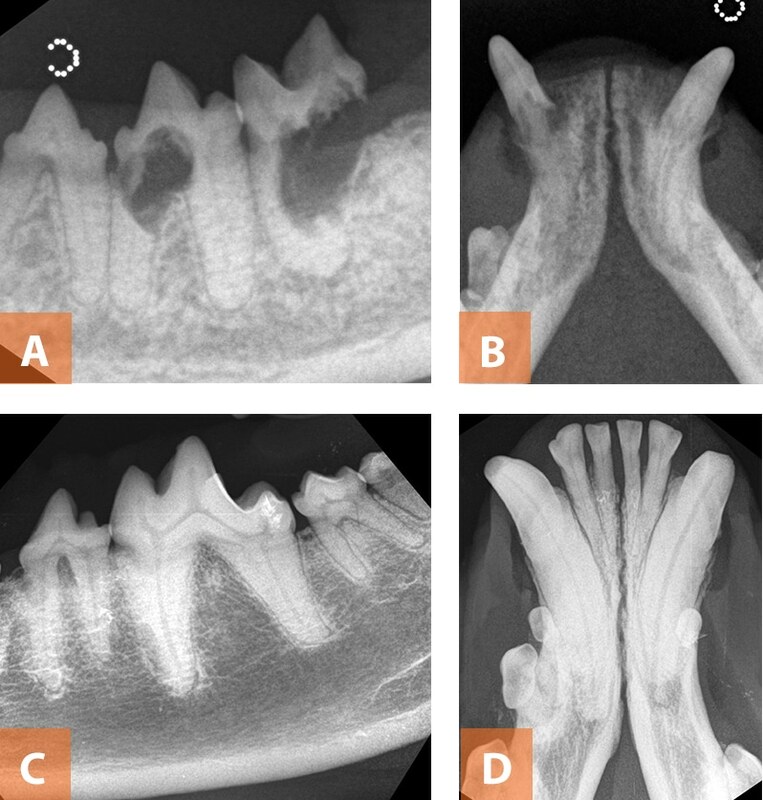 Figure 11A shows moderate horizontal bone loss with furcation exposure affecting the left mandibular fourth premolar and first and second mandibular teeth of a 10-year-old-dog. The first molar tooth also has vertical bone loss at the mesial aspects of both roots. Note the inflammatory root resorption affecting the distal root of the second molar tooth. Figure 11B shows near-total loss of attachment due to severe horizontal bone loss at the left mandibular first and second incisors in the same dog and left and right mandibular canine teeth. Note the inflammatory root resorption at the apical area of the first incisor tooth; also note the calculus deposits on the crowns of the canine teeth. Figure 11C shows moderate horizontal bone loss with furcation exposure at the right mandibular fourth premolar and first molar teeth in a 15-year-old cat; note the inflammatory root resorption at the furcation areas. Figure 11D shows buccal bone expansion affecting the right maxillary canine tooth more than the left in a 9-year-old cat; note the inflammatory root resorption affecting the right canine tooth; note also the retained roots present at the incisor area. Periodontal–endodontic lesions may be detectable radiographically if alveolar bone loss (ie, periodontitis) has allowed bacteria to enter the pulp cavity via the apical delta or accessory canals, with ensuing apical periodontitis. The radiographic characteristics usually include some degree of alveolar bone loss and periapical lucency around the root(s) (Figure 12). The prognosis of periodontal–endodontic lesions is poor. FIGURE 12. Periodontal–endodontic lesions. 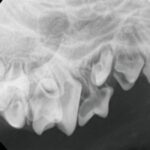 This radiographs shows a right mandibular first molar tooth in a 7-year-old dog. There is moderate to severe combined horizontal and vertical bone loss and well-defined periapical lucencies at both roots. Crown integrity may be lost because of traumatic fractures. Tooth fractures are visible radiographically, although pulp exposure cannot be reliably diagnosed on a radiograph (it is determined clinically). The loss of crown integrity (Figure 13A) should alert and encourage clinicians to look for radiographic indicators of endodontic disease (see Apical periodontitis and Relatively wide pulp cavities) because the most common cause of endodontic disease is trauma. Apical periodontitis is inflammation of the periapical tissues that invariably occurs in the presence of untreated endodontic disease (eg, inflamed or necrotic pulp). This inflammatory process is detectable radiographically after enough lysis of the associated bone has occurred (Figure 13B). Typically, the lesion appears as an ill- or well-defined round, lucent area that encompasses the apical portion of the root(s). Lack of radiographically detectable periapical lucency does not rule out apical periodontitis. Relatively wide pulp cavities—when compared with contralateral, opposing, or adjacent teeth—may indicate a longstanding nonvital pulp (Figures 13A and 13C). Clinicians should be aware that a lack of discrepancy in pulp cavity width does not rule out endodontic disease, especially in cases of endodontic disease of relatively short duration (a few days or weeks). Pulp stones are considered incidental findings that appear as mineralized structures within the pulp cavity on dental radiographs, sometimes in otherwise clinically and radiographically healthy teeth (Figure 13D). In the event endodontic intervention is required for unrelated causes, pulp stones may interfere with root canal instrumentation. Figure 13. Endodontic disease. Figure 13A shows an occlusal maxillary radiograph of a 5-year-old dog; note the fractured crown of the right maxillary canine tooth and the relatively wide pulp cavity when compared with the contralateral tooth. Figure 13B shows a fractured middle cusp of the left mandibular first molar tooth in a 6-year-old dog; note the well-defined periapical lucencies at both roots. Figure 13C shows the occlusal maxillary radiograph of a 9-year-old dog with severe abrasion of several incisors; note the relatively wide pulp cavity of the right maxillary first incisor tooth and the associated well-defined periapical lucency. 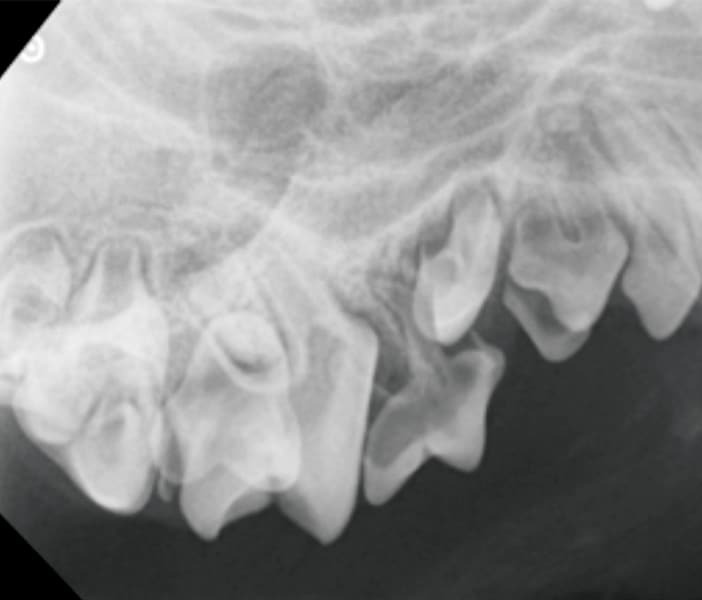 Figure 13D shows pulp stones at the mesial and middle pulp horns of the left mandibular first molar tooth in a 4-year-old dog; the tooth is otherwise periodontally and endodontically sound. Chevron signs are widened periodontal ligament spaces in the apical areas of endodontically sound teeth, often in the shape of a chevron, resembling radiographic signs of apical periodontitis (Figure 14). This occurs most frequently at the maxillary incisors, canines, and mandibular first molar teeth. It is believed these areas are normal anatomic variations and possibly correspond to vascular channels in the bone.11 A chevron sign is suspected in the absence of clinical and radiographic signs of endodontic disease; in some cases, however, it is very difficult to differentiate between a chevron sign and pathologic changes. FIGURE 14. Chevron sign. 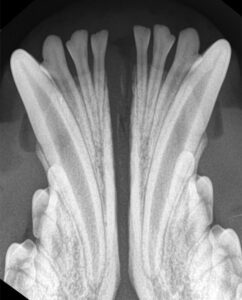 This radiograph is the lateral view of the right maxillary canine tooth in an 8-year-old dog. Note the wide lucent space at the apex. The lesion is not bulbous, round, or encompassing of the entire apical area, and the lamina dura appears intact. Given the lack of other radiographic indicators of endodontic disease, and in the absence of clinical signs, this finding should not necessarily be considered pathologic. Figure 15. Tooth resorption. 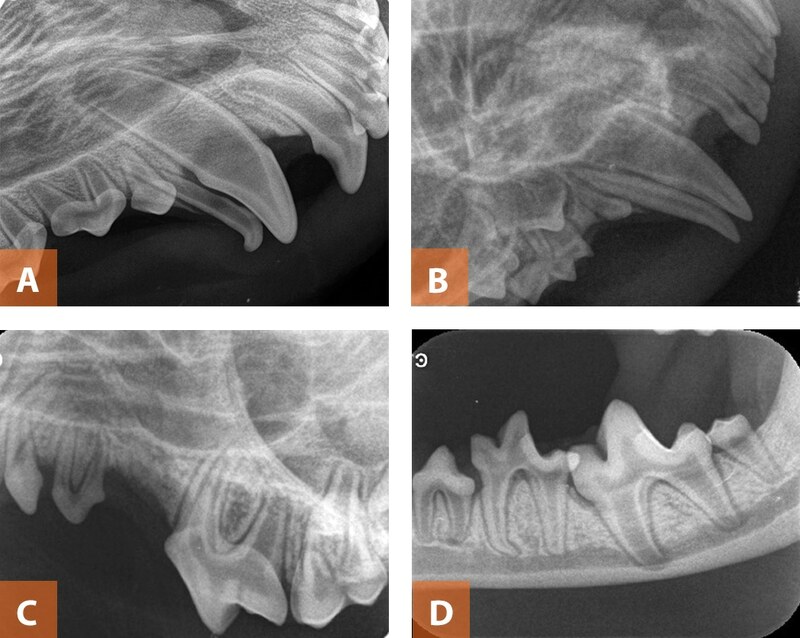 Figure 15A shows advanced inflammatory tooth resorption affecting the left mandibular fourth premolar and first molar teeth in an 8-year-old cat. Figure 15B shows advanced replacement resorption affecting the left and right mandibular canine teeth in a 14-year-old cat. Figure 15C shows replacement resorption affecting both roots of the left mandibular fourth premolar and mesial root of the mandibular first molar in a 7-year-old dog; note the loss of periodontal ligament space and sclerotic alveolar bone around the affected roots. Figure 15D shows inflammatory root resorption secondary to apical periodontitis at the left mandibular canine tooth in a 7-year-old dog; note the irregular and relatively short apical third of the tooth compared to the contralateral. Caries have not been described in cats, and the prevalence of caries is relatively low in dogs compared to humans. The radiographic appearance of a caries lesion depends on the stage of disease. Very early caries lesions may or not be detectable radiographically. Advanced caries lesions involving the dentin appear as cup-shaped cavitated lesions that may or may not extend into the pulp cavity (Figure 16). FIGURE 16. Caries lesion. An advanced caries lesion affecting the left maxillary first molar tooth in a 5-year-old dog; note the loss of crown integrity and apical periodontitis secondary to pulp involvement. Abrasion and attrition are wearing of teeth due to contact with an external object or surface (abrasion) or another tooth (attrition). Radiographically, abrasion and attrition usually appear as even or smooth loss of tooth surfaces of varying severity, often affecting multiple teeth (Figures 17A and 17B). Wear of dental structures can result in damage to the pulp; therefore, clinicians should be attentive to radiographic signs of endodontic disease (see Endodontic Findings). Figure 17. Abrasion and attrition. Figure 17A shows wear of the occlusal surface of the right mandibular second and third molar teeth in a 6-year-old dog. Figure 17B shows mild wear of the distal aspect of the right mandibular canine tooth in a 6-year-old dog, consistent with cage-biting behavior. Jaw lesions appear on dental radiographs as areas of bone loss of inflammatory, cystic, or neoplastic origin. The bone loss can have a geographic, permeative, or moth-eaten pattern.14 A geographic pattern is characterized by an area of bone loss that is uniform in appearance and has well-defined borders (Figure 18A). In contrast, a permeative pattern of bone loss is an area with poorly defined borders (Figure 18B). Multiple contiguous areas of bone loss with poorly defined borders characterize a moth-eaten pattern. Figure 18. Bone loss jaw lesions. 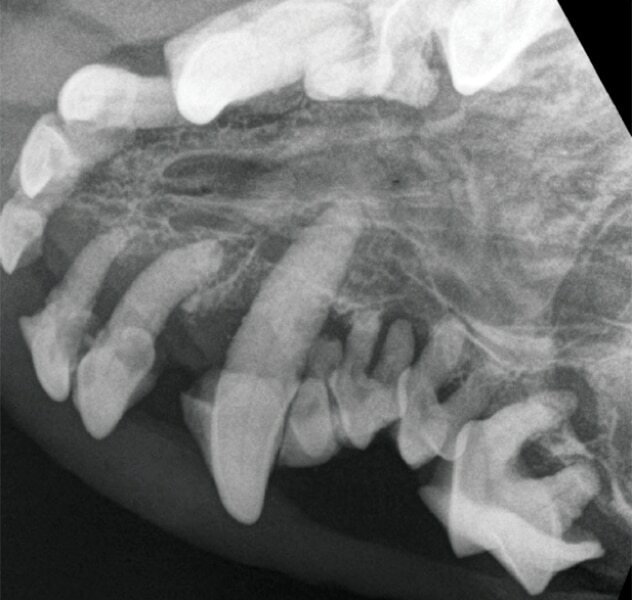 Figure 18A shows a multilocular lesion of geographic bone loss involving the right mandibular third and fourth premolar teeth in a 5-year-old dog. Figure 18B shows extensive permeative bone loss affecting both rostral mandibles in a 15-year-old cat. FIGURE 19. Mandibular fracture. This radiograph shows a comminuted mid-body fracture between the left mandibular third and fourth premolar teeth in an 8-year-old dog. Symphyseal separation may be observed if the fibrocartilaginous fibers at the symphysis have been stretched or torn as a result of trauma. The symphyseal space may appear wider than usual and an occlusal discrepancy between the right and left incisor teeth may be observed (Figure 20). FIGURE 20. Symphyseal separation. This radiograph shows an abnormally wide space at the symphysis of a 2-year-old dog consistent with symphyseal separation. Dental radiographs have some limitations and disadvantages compared with other modalities. For instance, unlike advanced imaging modalities (eg, CT, cone-beam CT), dental radiographs represent 2-dimensional images of 3-dimensional structures. Given the anatomic complexity of certain areas (eg, caudal maxilla) and the level of superimposition of dental and related structures, radiographs may fail to reveal lesions depending on their nature, location, extent, and severity. Moreover, dental radiographs are useful only for imaging teeth and associated structures in the immediate vicinity. They have little or no value for imaging other maxillofacial structures. Dental radiography has traditionally been, and still is, considered the gold standard for the diagnosis of dental disease in dogs and cats. In a general practice setting, its diagnostic value and the relatively low cost of required equipment make dental radiography the most practical imaging modality. Eisner ER. Standard of care in North American small animal dental service. Vet Clin North Am Small Anim Pract 2013;43:447-469. Holmstrom SE, Bellows J, Juriga S, et al. 2013 AAHA dental care guidelines for dogs and cats. JAAHA 2013;49:75-82. Verstraete FJ, Kass PH, Terpak CH. Diagnostic value of full-mouth radiography in dogs. Am J Vet Res 1998;59:686-691. Verstraete FJ, Kass PH, Terpak CH. Diagnostic value of full-mouth radiography in cats. Am J Vet Res 1998;59:692-695. Shabestari L, Taylor G, Angus W. Dental eruption pattern of the beagle. J Dent Res 1967;46:276-278. Wiggs RB, Lobprise HB. Veterinary Dentistry: Principles and Practice. Lippincott-Raven Publishers, 1997. Verstraete FJ, Zin BP, Kass PH, et al. Clinical signs and histologic findings in dogs with odontogenic cysts: 41 cases (1995-2010). JAVMA 2011;239:1470-1476. Fulton AJ, Fiani N, Verstraete FJ. Canine pediatric dentistry. Vet Clin North Am Small Anim Pract 2014;44:303-324. Fiani N, Arzi B. Diagnostic imaging in veterinary dental practice. JAVMA 2009;235:271-273. Carle DS, Shope BH. Diagnostic imaging in veterinary dental practice. JAVMA 2012;241:1283-1285. DuPont GA, DeBowes LJ, eds. Atlas of Dental Radiography in Dogs and Cats. St. Louis, MO: Saunders Elsevier; 2009. Peralta S, Verstraete FJ, Kass PH. Radiographic evaluation of the types of tooth resorption in dogs. Am J Vet Res 2010;71:784-793. Peralta S, Verstraete FJ, Kass PH. Radiographic evaluation of the classification of the extent of tooth resorption in dogs. Am J Vet Res 2010;71:794-798. Amory JT, Reetz JA, Sanchez MD, et al. Computed tomographic characteristics of odontogenic neoplasms in dogs. Vet Radiol Ultrasound 2014;55:147-158. Bar-Am Y, Pollard RE, Kass PH, et al. The diagnostic yield of conventional radiographs and computed tomography in dogs and cats with maxillofacial trauma. Vet Surg 2008;37:294-299. Arzi B, Cissell DD, Verstraete FJ, et al. Computed tomographic findings in dogs and cats with temporomandibular joint disorders: 58 cases (2006-2011). JAVMA 2013;242:69-75. Campbell RD, Peralta S, Fiani N, Scrivani PV. Comparing intraoral radiography and computed tomography for detecting radiographic signs of periodontitis and endodontic disease in dogs: an agreement study. Front Vet Sci 2016;3. Soukup JW, Drees R, Koenig LJ, et al. Comparison of the diagnostic image quality of the canine maxillary dentoalveolar structures obtained by cone beam computed tomography and 64-multidetector row computed tomography. J Vet Dent 2015;32:80-86. Tsugawa AJ, Verstraete FJ. 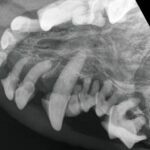 How to obtain and interpret periodontal radiographs in dogs. Clin Tech Small Anim Pract 2000;15:204-210. Lommer MJ, Verstraete FJ, Terpak CH. Dental radiographic technique in cats. Compend Contin Educ Pract Vet 2000;22:107-116. Floyd MR. The modified Triadan system: nomenclature for veterinary dentistry. J Vet Dent 1991;8:18-19. All radiographic images provided are representative examples that support the explanations presented in the article. They are displayed based on labial mounting and considered to be of diagnostic quality. Some of the images have been cropped, but the structures of interest have not been altered or enhanced. All images were acquired following standard technique for small animals19,20 using a commercially available dental radiography unit (Heliodent DS, Sirona, Bensheim, Germany) and a computerized radiographic processor using phosphor plates of size 0, 2, or 4 with corresponding software (CS7600, Carestream, Rochester, NY). Due to space limitations, most radiographs shown are from dogs. In case some readers are unfamiliar with other accepted systems (ie, modified Triadan), anatomic dental nomenclature is used here.21 For more information, interested readers are encouraged to consult a more specialized source. The College of Veterinary Medicine at Cornell University (CVM) owns and retains the copyrights to all images. The CVM grants permission to use the provided images within the context of the articles titled Interpretation of Dental Radiographs in Dogs & Cats – Part 1: Principles & Normal Findings and Interpretation of Dental Radiographs in Dogs & Cats – Part 2: Normal Variations and Abnormal Findings. Santiago Peralta, DVM, DAVDC, is an assistant professor of dentistry and oral surgery at Cornell University College of Veterinary Medicine. His clinical and research interests include the microbial pathogenesis of dental diseases, comparative aspects of maxillofacial birth defects, comparative aspects of maxillofacial imaging, and molecular mechanism of oral tumor formation in dogs and cats. Dr. Peralta received his DVM from Universidad de La Salle in Bogota, Colombia, and completed a 3-year residency in dentistry and oral surgery at the University of California, Davis. Nadine Fiani, BVSc, DAVDC, is an assistant clinical professor of dentistry and oral surgery at Cornell University College of Veterinary Medicine. She has an interest in education and a clinical interest in endodontics and zoo dentistry. Dr. Fiani received her veterinary degree from the University of Sydney and completed a rotating internship followed by a 3-year residency in dentistry and oral surgery at the University of California, Davis. Before her current position, Dr. Fiani spent 3 years in private referral practice in Sydney. This article is the second of two articles that focus on interpretation of dental radiographs in dogs and cats. 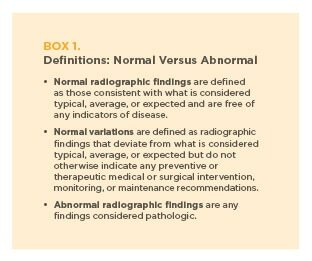 It includes normal dental variations and pathologic findings that can be viewed on dental radiographs. The article you have read has been submitted for RACE approval for 1 hour of continuing education credit and will be opened for enrollment when approval has been received. To receive credit, take the approved test online at vetmedteam.com/tvp.aspx A $5 fee applies. Questions and answers online may differ from those below. Tests are valid for 2 years from the date of approval. What does the radiograph below show? Which of the following statements is true about retained teeth? A. They represent an incidental finding during oral examination. B. They cannot be detected radiographically. C. They are associated with dentigerous cyst formation. D. They usually involve deciduous teeth. When is the term hypodontia applicable? A. The teeth present are abnormally small. B. Several teeth are missing. C. Only a few teeth are present. D. Deciduous teeth persist after normal exfoliation times. True or false: The amount of calculus detected clinically and radiographically is an excellent indicator of the severity of periodontal disease. Which of the following are visible on the radiograph below? Which of the following is true regarding the pulp cavity of a nonvital tooth? A. It becomes progressively wider due to internal resorption. B. Its width remains static while the pulp cavity of vital teeth progressively narrows. C. It becomes progressively narrower due to tertiary dentin formation. Which radiographic sign is not indicative of endodontic disease? True or false: Pulp exposure is a clinical but not a radiographic finding. True or false: Tooth resorption occurs in cats but not in dogs. Which is the imaging modality of choice in cases of maxillofacial trauma?